Standing on the stairs above the crowd, Paul speaks to the people in Hebrew. EARS HAD PASSED since the wicked Herod had tried to kill Peter, and during those years the church in Jerusalem had grown into a multitude. Some of the enemies who had killed Jesus were yet alive, and they hated the Christians. But they had ceased persecuting them as bitterly as in the first days of the early church. Paul had met with multitudes of believers in the churches of other lands. But these in Jerusalem were all Jews, and many of them looked with displeasure upon the people of other nations. They had not yet learned how God's love reaches out to all men. And because they had heard much about Paul's missionary labors among the Gentiles they felt unwilling to approved of his work. The leaders in the church at Jerusalem understood how God had chosen Paul to be a missionary to the Gentiles. They rejoiced to know that even the Gentiles might be saved by faith in Jesus. But they understood also the feelings of many who worshiped in their services, so they warned Paul about these Jewish believers. They said, "These men have heard that you do not keep the law of Moses, but that you teach the Gentiles to forsake the law." And they urged Paul to show these believers that he did not despise Moses' teachings, as they supposed. To please these men Paul visited the temple and performed the ceremony of cleansing, according to Moses' law. Almost a week passed by, then one day while he was in the temple some Jews from Asia Minor came to worship there. Seeing Paul, they recognized him at once, for he had taught in their synagog concerning Christ. And they had not accepted his teaching. They hated him because he taught that Gentiles as well as Jews might become the people of God. They became excited when they saw him worshiping in the Jewish temple, and they cried out against him. Soon the old enemies of Jesus heard about the excitement, and they rushed in to seize Paul. A crowd quickly gathered, and they pulled Paul out of the temple and shut the doors. Not waiting to drag him outside the city, they began beating him at once, and would have killed him had not the Roman captain arrived with soldiers to investigate the trouble. Supposing Paul must be a desperate fellow, the captain commanded that he should be bound with two heavy chains. Then he asked what Paul had done. But some cried one thing and some another, and he could not hear in the noise of the angry mob what offenses Paul was guilty of committing. So he led Paul away to the castle where prisoners were kept. The mob followed, crying, "Away with him!" 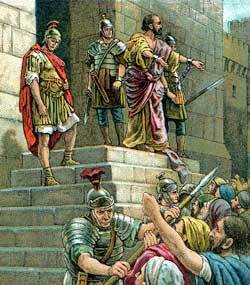 And the soldiers, fearing the people would tear Paul in pieces, picked him up and carried him on their shoulders to the castle stairs. As they went Paul asked to speak to the captain. At this, the Roman captain was surprised, for he did not know Paul could speak his language. He gave Paul permission to speak to the mob when they reached the stairs. Then, standing on the stairs above the heads of the excited followers, Paul beckoned to them with his hand, and they grew quiet. He began at once to talk to them in the Hebrew language, which the Romans could not understand. This language the Jews love, and they listened attentively to him while he told them about his early life and training. He reminded them of his student-life in their city, where he became a Pharisee. He reminded them also of his former hatred toward the believers in Jesus, and of his bitter persecutions against them. Many who stood in the crowd below had not forgotten the Saul who tried to break up the early church in Jerusalem. Paul then told about his journey to Damascus, where he intended to persecute the Christians. He told about the vision that came to him on the way, and about the voice that spoke to him from heaven. He even told how he had been baptized in the name of Jesus, and how when he had come to Jerusalem to worship God showed him in a vision in the temple that he must go to Gentile countries and there preach the gospel. But when Paul began speaking about preaching to the Gentiles, then no longer would the people listen to his speech. Their hatred of Gentiles stirred their hearts to cry out once more against Paul, and now they even cast off their cloaks and threw dust into the air, shouting aloud, "Away with such a fellow from the earth! He is not fit to live!" The Roman captain and his soldiers did not understand what Paul had spoken to the angry people, and they supposed he must be a dangerous fellow. They therefore brought him into the castle and determined to learn the nature of his crime. Bringing out cruel instruments of torture, they began to bind Paul. But Paul knew the law of the Romans, that it did not permit a Roman citizen to be punished in this manner, so he spoke to a soldier who stood near by and told him he was a Roman. This soldier hurried away to tell the chief captain, who came quickly and asked, "Tell me, are you a Roman?" This frightened the men who were preparing to torture Paul. Even the chief captain was frightened, for he had given the command that Paul should be bound and punished. Still the Romans were puzzled about their prisoner. They could not understand what terrible thing he had done. On the next day they called the chief rulers of the Jews to assemble together, and brought Paul before them. While Paul spoke the chief captain saw that even these Jewish rulers were not agreed what to do with him. Some wished to set him free, while others insisted on putting him to death. Then the captain sent his soldiers to take Paul away from their midst, fearing they might kill him.